In less than a week’s time we’ll be hosting the second ever SteamCon US in Nashville, Tennessee, and we couldn’t be more excited! It’s going to be a weekend to meet new people from across our awesome community and reunite with old friends once more, make some incredible memories, and of course, play some great games! You haven’t bought a ticket yet? There’s still time! Buy your ticket for SteamCon US HERE and join us for a weekend-long celebration of all things Steamforged Games! Most of you will have seen the earlier version of this, but for those who haven’t, the SteamCon schedule is designed to let you customise your weekend exactly as you choose. You wanna play competitive Guild Ball all weekend? We have the US Championship on Friday and Saturday (both days being played with Season 3 rules) as well as smaller ‘scramble’ events running all weekend. Alternatively, if you just want to celebrate the arrival of Guild Ball Season 4 in a more laid-back environment, we’ll have 24 hour casual gaming space open all weekend long, in addition to our very own Season 4 Launch Parties. If you’re lucky you might even be able to catch a game with one of the Steamforged Games staff! Godtear Lead Developer Steve Margetson will be floating around our Godtear open play tables for most of the weekend, available for games and any questions you have about Godtear. Whether you’re looking for a demo of Godtear or if you’ve been keeping up with Godtear Early Access, this will be the perfect time to meet and play with other fans of the game. 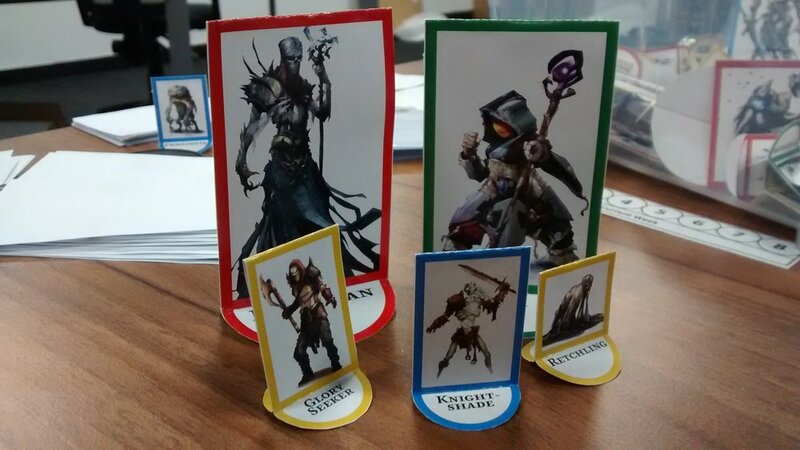 Also, we’ll be bringing with us a whole load of full art standees to play with so that you can play Godtear with EVERY champion that has Early Access rules! Perhaps a painting or modelling masterclass is more your thing? We have Beckley Bradford and Michael Archer running painting, terrain & modelling classes on Friday, Saturday, and Sunday! If you’ve had your fill of gaming for the day, come along and brush up on your hobby skills. Our Friday class with Michael Archer will be ‘The Tears of a God’: This class will teach people some basic terrain skills while they get a chance to make their own Godtear objective hex for the upcoming release of Godtear to help set the scene for your games. Different coloured crystals will be provided and each person who attends will get to choose what kind of Tear they want to make. Topics covered: plastic card bases, working with Aves epoxy sculpt, and basic sculpting techniques. Alternatively, visit the Steamforged store where you can pick up the latest releases. Additionally, SFG Sculptor Ben Charles will be running one to one sessions where he’ll walk you through digitally sculpting your own piece of the Guild Ball world. Would you like to know more about the world of Guild Ball? Guild Ball Lead Writer Sherwin Matthews will be running the ‘Guild Insider’ seminar on Friday October 12th. In this seminar we'll be discussing some of the themes of the upcoming Season Four lore and how it ties into the story so far, as well as the narrative decisions and challenges which went into creating other Guild Ball literature such as Theron Origins, Union in Chains, and the Free Cities Draft. Following this we'll also have time for a question and answer session where you can ask your questions about the Guild Ball backstory. Finishing off the day, the SteamCon Mixer is a nice and relaxed way to cool off after a hard day of convention activities. Plus, there’s usually some extra goodies just for turning up! Continuing onto Saturday, the top 8 players from day one of the Guild Ball US Championship will be duking it out to see who gets to step on the plane to SteamCon UK for the World Championship Finals. We’ll also be running the fan-favourite Guild Ball Doubles tournament so you can pair up with a friend and try out your brand-new Season 4 players in a fun and friendly atmosphere! Saturday will be the main day for celebrating the arrival of Guild Ball Season 4. We’ll be running even more Launch Parties in the casual play area and all our scramble events will be running Guild Ball Season 4! Saturday’s hobby class with Michael Archer will be Guild Ball Terrain and Scenic Base Making. With this class Michael will teach the basics of working with pink foam. Each participant will have a chance to work hands on with the material and make something of their own which they can take with them; for instance an obstacle or obstruction which can be used in their games of Guild Ball. Alternatively, come grab some bits and build a base or two for your Guild Ball team or Godtear models, supplies are on hand to craft some epic bases! Bring a model or just have fun making a base for a future model. Back to the seminar room and we’ll have an extra special session featuring Guild Ball Lead Developer Jamie Perkins and Lead Writer Sherwin Matthews. The fan favourite ‘Design a Model’ seminar will be reappearing in an even bigger and better format! This time we’ll be walking through the process of designing a Minor Guild! Come along and help Jamie and Sherwin explore the themes and playstyle of a mysterious new Minor Guild for the Brewer’s Guild! To cap off the end of a huge day, join Jamie, Sherwin & Steve as well as fellow developer Bryce Johnston for the SteamCon US Keynote! We’ll be talking about some of the things Steamforged Games has planned for the future, followed by a question & answer session with the SFG Development Team. After the rush of Friday and Saturday, Sunday a little more relaxed but still packed with loads to do! We’ll be running even more Guild Ball scramble events and open play, as well as Godtear open play. Our challenge tables and the Steamforged store will still be open and available. There will also be one last chance to sneak in some extra hobby time with Elizabeth Beckley and Michael Archer before we round off the weekend with a small closing ceremony. Wait, Did You Say The Dev Team At The Keynote? Yes, we did. At Steamforged Games, we always try to go the extra mile to bring you the highest quality games and products that we can. From time to time when things go slightly wrong, we try to attack the problem head-on and ultimately resolve it as quickly and efficiently as possible. We know that several of you are already aware of the issues we experienced earlier this year with the Minerva model from the Falconer’s Guild and how we resolved them. As a result of this, unfortunately Steamforged Games cofounder & CEO Richard Loxam and cofounder & CCO Mat Hart will be unable to attend SteamCon US. During the convention, both will be in the middle of spending a few weeks on the ground visiting our factories in China with the sole aim of personally ensuring that the high standards we set for our products can be maintained going forward. The schedules with our production partners allowed them no other time to make this trip, and while both Mat and Rich are deeply disappointed to be missing SteamCon US, they made the very hard decision to go and meet our partners instead of attending. They’re confident that you’re in safe hands with the rest of the Development Team in attendance, however! If you’d like to book into any of our hobby events at SteamCon US, click the link below. You’ll be able to book yourself into any of our painting classes with Beckley Bradford, modelling classes with Michael Archer, or have a one to one sculpting demo with Ben Charles! See you this weekend! it’s going to be awesome! The SteamCon USA Schedule is here! Tickets will be on sale at 12:00BST on August 7th.